Velassaru Maldives – The finest white sand beach and turquoise lagoon accessible by speedboat. Minimal chic revealed in teak, stone, thatch. Mid-ocean niches of intimacy beckoning, bathed in light. Impulses, answered as only you know how. Linger over a sampling of the world’s flavours in an overwater pavilion. Champagne flutes anchored in the sand. Moonlit vows, eye to eye with your best intentions laid bare. Romance as living force, not performance. The gut impact of seduction. You only see so many sunrises like this in your life. 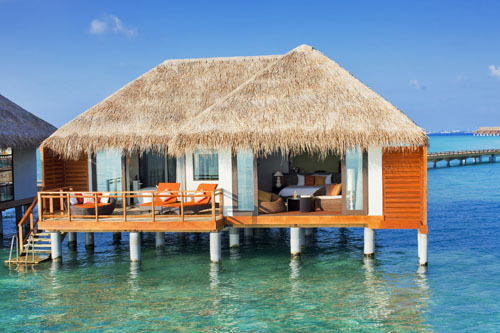 28 Water Villas – Celebrate the ocean, perched over the turquoise lagoon. A full sea-facing wall provides ocean visibility from all parts of the room, including the bed. Bathroom with water court, and steps leading to the lagoon for a snorkel or swim weave you into the languid folds of the stunning seascape. 17 Water Suites – Minimal luxe amidst breathtaking surrounds. Thatched roofs provide natural shelter, complemented by modern interiors and spacious elegance. The Water Suites offer maximum privacy and stunning views over the crystal clear lagoon. 30 Beach Villas – Individual villas, generously proportioned for optimal living space within and without. Coconut thatch and high ceilings crown modern, elegant interiors of built-in stone and teak, bathed in light. Seamless, natural living, with garden bathroom, indoor and outdoor shower, and terrace with daybed overlooking the ocean. The white sands of the beach are a step away. 54 Deluxe Bungalows – Set in the gardens facing the beach, Bungalows are a welcome refuge with an open terrace, daybed and garden bathroom. Vela – World cuisine with an informal vibe. Vela means ‘turtle’ in Maldivian, so indulge in fine dining at your own pace. Etesian – Mediterranean restaurant with indoor and al fresco seating, cocooned in lush island greenery. Vilunoo – Vilunoo in Maldivian describes the turquoise of the Velassaru lagoon. Food theatre on one of the most beautiful beaches you may ever visit. Oceanfront grill. Live cooking stations. Far East, European and Indian cuisines. Fen – The bar. Indoor. Outdoor. Diving in. Chilling out. Delicious nibbles throughout the day to sate the appetite while overlooking the infinity pool and the ocean. Villa Dining – When nowhere else is private enough, Villa Dining is available around the clock. Private Dining – Intimate, customised events at special venues on and around the island.